By the early 1990s, the industry was rolling out another approach to smart homes. The technology had many names at first, but today the industry has settled on the name structured wiring. However, the standards bodies have recently given the technology the designation of structured cabling. This new cabling system was initially developed by manufacturers in the voice and data industry for commercial applications. It was subsequently reengineered and downsized for residential applications to make the technology practical, economical, and worthwhile to consumers. Today, the primary market for structured cabling is in new construction, where it provides the backbone for the distribution of voice, data, and video signals throughout the home. Structured cabling systems are now being installed in virtually all areas of new construction, from tract homes that sell for under $200,000, to custom homes costing millions of dollars. Multi-housing units on college campuses, senior citizen housing complexes and upscale apartment buildings are also being built with structured cabling systems installed. Over the past five years, structured cabling has gained mainstream acceptance. A survey conducted by the National Association of Home Builders found that 34 percent of all builders now offer structured cabling system packages as a standard or optional amenity. National builders, like Pulte Homes, are installing a basic structured cabling system in every new home they build, while offering homeowners a full range of optional components that can be installed during the construction phase, or any time in the future. Another survey, conducted by Parks & Associates, examined structured cabling installations as a percentage of all housing starts from the year 2000 to 2004. In 2000, 14 percent of all new homes had structured cabling systems. The study forecasts an increase in installations to 48 percent by the year 2004. The demand for structured cabling is creating rapid growth in this new market. According to Cahners In-Stat Group, structured cabling will become a $1.4 billion market by 2004, a sizeable increase from $123 million in 2000. Builders are more familiar with structured cabling and recognize that it gives them a competitive edge. Furthermore, if they do not install a structured cabling system, they run the risk of building new homes that will quickly become obsolete. Industry-wide standards for structured cabling have been established by the Telecommunications Industry Association (TIA), and manufacturers’ products now conform to that single standard. There is greater penetration of broadband services into the home, such as high-speed Internet connectivity through DSL and cable modems, and greater consumer demand for these services. There are more professionals trained in installation techniques. Homebuyers are recognizing that the lifestyle benefits of a structured cabling system are worth the 1 to 2 percent that a system adds to the cost of a new home. The real estate industry is recognizing that the resale value of new homes could be adversely affected if a home does not have the fourth utility installed. Back in the 1950s it was the rare American family that had more than one telephone line coming into the house. As the kids grew up and entered their teenage years, intense competition for using the phone usually led to arguments and strict rules for telephone use. Early in the 21st century, families find themselves facing a similar dilemma—everyone wants to be on the Internet at the same time. Moreover, no one likes to sit and wait for website pages to download, especially pages with graphics, photos, and video content. The problem: conventional telephone wiring was not designed for high-speed data communications. Homes without structured cabling systems do not have the infrastructure to support the latest networking and entertainment applications consumers are demanding. This includes whole-house distribution of digital cable, MP3 music files, and Internet-based gaming and streaming video. Another frequent homeowner complaint is poor television reception when multiple televisions share a single cable TV connection using simple cable TV splitters. The emergence of the home office also places greater demands on conventional telephone wiring that was not designed to support a data communications network in the home. Indeed, today’s new homebuyers put a home office high on their list of “must have upgrades” when looking at new homes. Their intent is to set up a home office with two or more telephone lines, a fax line and a high-speed Internet connection. They also want to share files between their home computers and share peripheral equipment, such as printers, scanners, cameras and back-up disk drives. Structured cabling systems are based on a home run wiring scheme, also known as a star topology. In a modern wired home, all the cables originate from a single distribution enclosure. This enclosure can have various names, depending on the manufacturer. 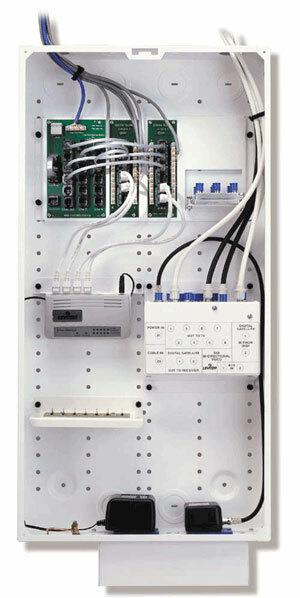 Leviton, for example, calls the enclosure a Structured Media Center™, Other manufacturers refer to it as a structured wiring cabinet, customer premise enclosure, a hub, et.al. The standards bodies now refer to it as a distribution cabling device. The distribution cabling device serves as the “nerve center” of the system. It contains all the modules/components for networking voice, data, video and audio signals in the home, as well as modules that interface with other home systems, such as security and HVAC systems (photo 1). Distribution cabling devices are available in various sizes and configurations, depending on the manufacturer’s specifications and design. Structured cabling systems use two basic types of wire: unshielded twisted pair (UTP) cables and coaxial cables. UTP cables, such as Category 5 and 5e, contain four pairs of twisted wires inside a single cable jacket. The way the wires are twisted reduces noise and provides the bandwidth required by Internet connections and modems. UTP cabling is predominately used for distributing voice and data signals, while RG-6 coaxial cable is used to distribute video signals. In some high-end applications, 50-micron multimode fiber optic cable is used in place of UTP. UTP and coaxial cables are terminated in each room at wall outlets designed for high-quality data and audio/visual (a/v) signals. Wall outlets feature snap-in jacks and connectors that can be quickly installed. Structured cabling is intended to support a dynamic range of both high- and low-end applications, such as 10/100/1000-Base-T Ethernet and analog voice. The same cabling system infrastructure allows the homeowner to flexibly manage the current and future use of the connectors in the wall. This flexibility is a hallmark of a structured cabling system and is one way the system “future proofs” a home. Telephone Service: The telephone module distributes telephone lines throughout the house over UTP cabling. In a basic installation, up to four separate telephone lines are distributed. Computer networking: Several modules are available for creating a home network, including Ethernet hubs for sharing files and peripheral equipment, and Internet gateways that also create a home network, allowing multiple users to share a single broadband Internet connection simultaneously. A second benefit of the Internet gateway is that it creates a hardware-based network address translation (NAT) firewall, which makes the computer’s Internet address invisible to a hacker. Home Entertainment: Audio and video modules can create an integrated, whole-house entertainment system. For whole-house audio, modules are available that interconnect a homeowner’s stereo amplifier or receiver to distribute stereo sound throughout the house over CL3-rated speaker wire. Leviton, for one, has an alternative technology based on an audio/video module that uses UTP cabling to distribute line level audio and composite video signals, such as MP3 files, Internet radio and streaming video that reside on a computer. To distribute video, one way and bi-directional modules are available. A bi-directional video module can distribute all types of video sources, including digital and standard cable modem TV, satellite TV, DVD and VCR. Also available is an enhanced RF video distribution module with an attenuator that can variably boost the video signal strength of cable TV signals before they are distributed throughout the home. Home Monitoring: By installing indoor and/or outdoor cameras, structured cabling can create a closed circuit TV system (CCTV) within the home for home monitoring. The cameras produce high-quality video output that is routed through the bi-directional video module. The video can be viewed on any TV in the home connected to the structured cabling network. With additional components, it is also possible to access the home’s CCTV over the Internet, which lets homeowners monitor their homes when they are out, or monitor a vacation home. Home Automation: Other low-voltage systems, such as security and alarm systems and HVAC systems, can be integrated into a home’s structured cabling system. By doing this, a homeowner can access the alarm system or HVAC system by telephone. Structured cabling provides the best performance- to-cost ratio in new construction, but there are other technologies better suited to retrofit applications. While these technologies are less costly to install, they offer more limited performance. Included in this category are: HomePNA, that utilizes a home’s existing telephone cabling; HomePlug, that utilizes existing line voltage wiring; and wireless solutions, such as HomeRF. 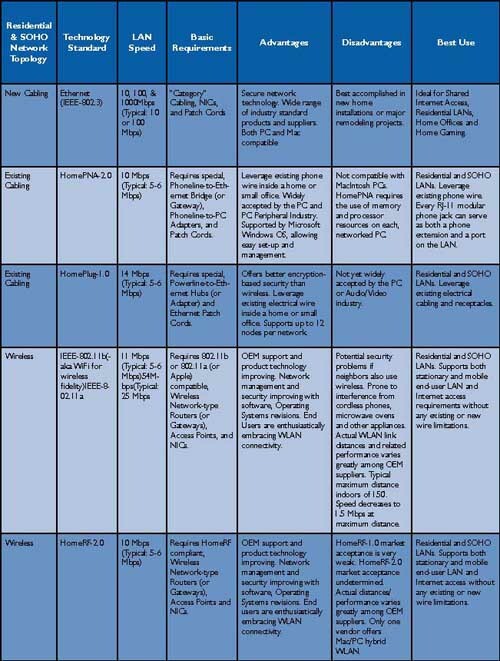 Compared to structured cabling, these technologies are less costly to install in existing homes, but they do not offer the same capabilities or features of a structured cabling system (table 1). 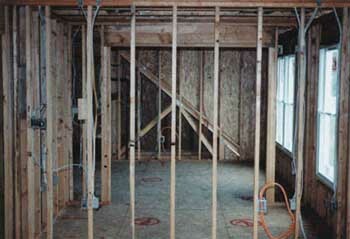 New home builders see the advantages of installing structured cabling systems while the house is under construction. Not only do structured cabling systems support more capabilities, such as audio and video distribution, but builders recognize that a wired backbone is more cost-effective and more reliable than the other alternative technologies. Structured cabling systems also offer the builder a competitive edge, not so much against other new home builders, but against existing homes that are on the market. In new construction, builders can choose from a range of installers. Professionals already familiar with low-voltage wiring systems include security and alarm installers, audio/video installers and system integrators. Over the past five years, more electrical contractors have received training in installation techniques and are now actively engaged in structured cabling installations. Some larger contractors have developed a separate low-voltage division dedicated to structured cabling for new construction. In residential applications, structured cabling installations must conform to the TIA/EIA-570-A Standard, which is currently under revision. The present 570 standard specifies two types of structured cabling installations, called grades. A Grade 1 installation stipulates that each structured cabling drop consist of one UTP Category 3 cable and one RG-6 coax cable. A Grade 2 installation stipulates that each structured cabling drop consist of two UTP Category 5 cables (or Category 5e), and two RG-6 coax cables. The proposed revision upgrades the UTP cable to one Category 5e and one RG-6 per drop for a Grade 1 installation, and two Category 5e cables and two RG-6 cables per drop for a Grade 2 installation. What is happening, in effect, is that the industry is upgrading the UTP requirement to Cat 5e, eliminating Cat 3 and Cat 5 from all approved structured cabling installations. Generally, UTP cable should not be in the same enclosure as Romex. However, the NEC (NFPA 70) allows for exceptions where both line voltage and low-voltage cabling are installed in the same device. You will find these convergent devices in lighting control devices that use UTP cabling for the control signals and nonmetallic sheathed cable for the lighting loads. Other convergent devices now being used in conjunction with home automation applications include fire, security and HVAC control circuit devices. With the exception of these convergent devices, the NEC requires a physical barrier between the high-voltage and low-voltage cables. For aesthetic reasons, some manufacturers are offering hybrid wall outlets that combine electrical outlets with certain low-voltage controls in the same box, with the barrier between them (e.g., to allow a light switch and a volume control to share a multi-gang wallplate). Contractors may also install an electrical outlet adjacent to a low-voltage box. Here, the barrier is provided by the two separated boxes. Line voltage is also present in the structured cabling enclosure in the form of a flush AC receptacle, which provides power to DC converters used in conjunction with structured cabling modules, such as data networking hubs and video amplifiers. Thus, the structured cabling enclosure must be connected to the house ground. The information revolution has paved the way for structured cabling to enter the mainstream of new home construction, where it will take its place alongside the other essential home services —namely, telephone, gas and electricity—as a fourth utility. Without a doubt, electrical inspectors will be seeing more homes with structured cabling installations in the coming years. Previous article3rd Harmonic Blocking Filter: Is the Cure Worse Than the Disease? Next articleA Look at Resolutions, again! Anyone Can Be a Residential Electrical Inspector?